Eye On Tampa Bay: Don't block my view! We wrote about the Residences at the Riverfront, aka the Straz tower, and video blogged about it, when the Tampa City Council voted to proceed with its development. Now, in addition to the questionable location smack in the middle of the Straz, it's blocking someone's view! TAMPA — A resident of downtown’s Skypoint condo tower has filed a lawsuit seeking a halt to plans for the Residence at the Riverwalk tower, saying it will spoil his view. Attorney John P. Baker filed suit against the city on Sept. 20, less than a month after Tampa City Council rezoned an acre of city-owned land straddling the junction of Tyler and Cass streets to allow for the 400-foot high-rise. At that same meeting, council members voted 5-1 to vacate part of Tyler to allow the west end of the street to be relocated as part of the tower project. Baker raises concerns around the "rushed and haphazard process" to approve the Residence at the Riverfront, something we agree with. In his lawsuit, Baker says he bought his 15th-floor condo partly for the sweeping views of the Hillsborough River and Cultural Arts District. “These views were very important to Mr. Baker when he selected his unit,” the suit notes, adding that Baker relied on the promise of the long-range plan when he decided to buy his condo unit. But such is the price of the progress, whether its downtown, blocking sweeping views, or elsewhere, such as rural Lithia. [A] developer is asking the county to amend its Comprehensive Plan to allow construction of 77 homes on what is currently a cow pasture east of one of those subdivisions — FishHawk Trails. But residents already living out that way are pushing back. A group calling itself “Save Rural Lithia” sent a rash of emails to The Planning Commission opposing a change in the land-use designation on the 194-acre tract. Initially, the developer asked for a designation that would allow one house per acre, up from one house per five acres. So it seems no matter where Hillsborough expands, someone will sue. Downtown or in the rural part of the county, we have to save ourselves from ourselves. Yet Hillsborough County is projecting continued growth. 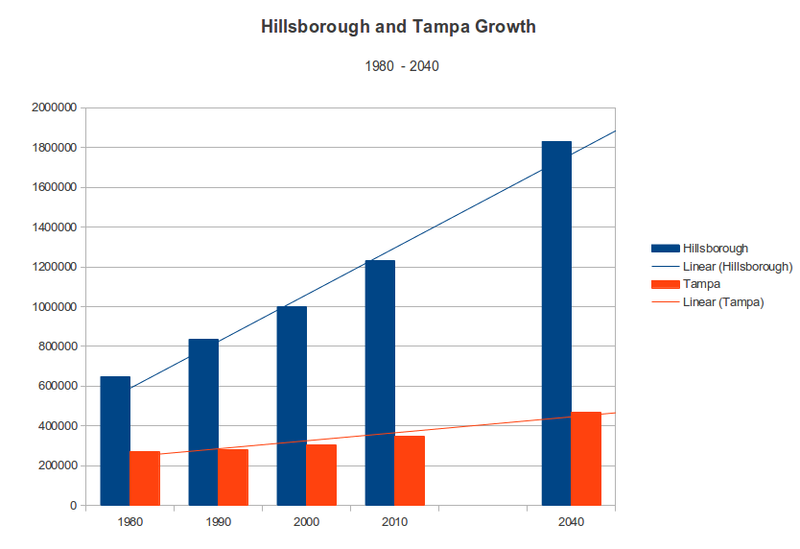 Hillsborough County alone could gain 600,000 people to reach a population of about 1.8 million — and add 400,000 jobs to reach 1 million by 2040, mid-level projections in a University of Florida study indicate. That does sound like a lot, but it is in line with the growth in Hillsborough County over the last 30 years or so, using census data and the UF projections for 2040. If Hillsborough does indeed gain 600,000 new residents in the next 25 years or so, something will have to give, including sweeping views of downtown and some peaceful scenery in Lithia. These people will have to go somewhere. Where will they go? Will they all want to move downtown, stacked and packed in more Residences at the Riverwalk canyon of towers style? How many 36 stories, 500 residence towers will we need? How many towers will we need? How many towers per year? The Residences at the Riverwalk tower is on 1 acre, so we'll need 1200 acres for this utopia... which of course, is not available downtown. Is this a ludicrous example? I guess it depends who's planning. But those new residents will live somewhere. If current trends continue, most will chose to live in Hillsborough County rather than in Tampa proper. At least there is some space in Hillsborough County, as it is a rather large county, still with significant rural areas that could be developed, along with the necessary new roads and infrastructure to accommodate the new growth. All the planners are collaborating on the new plans for 2040. You can checkout the Hillsborough MPO's site at imagine2040.com and provide your input. They only provide 3 main scenarios on how they want to direct growth for us, but there is plenty of room for creative and constructive comments. But something tells me they'll be blocking some views.